It's 44 days to Christmas and I feel like that's the perfect time to start planning not just the gifts and presents to buy but the outfits to wear. There's lots of opportunity to get all dressed up and finding a dress that is just right for all the different occasions can be quite the task. I loved the dress I wore for my Works Christmas Night Out last year and I'm definitely taking a bit of inspiration again this year focusing on the midi length and considering the one shoulder, or sleeves and bodycon. A website that keeps popping up in ads is ChicMe and although I've not used them before I'm very tempted after seeing these 8 gorgeous Christmas Night Out contenders. This Off the Shoulder Thigh Split Dress is the dress that first caught my attention. I actually really like the purple/lilac colour and with the sparkle and shimmer it's perfect for Christmas. I like the mix of sleeves, midi length but also the split. A good mix of sophisticated and dance floor ready. A bit like last year's dress I'm loving the One Shoulder Bodycon Dress. Definitely a different colour than I would normally pick out but I'm drawn to the army green, as well as the wine red version. Okay so the Off the Shoulder Jumpsuit isn't a dress but it's gorgeous! The one thing I'd be worried about is it being too long for my short leggies. I love the lace and Bardot neckline. You can't go wrong with a black party outfit. The last one if probably most typical of me - Off the Shoulder Sparkle Bodycon Dress. I'm a complete magpie so the sparkle drew me in, the off the shoulder style is still very much on trend and the slightly longer length is a bit classier. Oh my days, how gorgeous is the Sequin Wrapped Dress? It's a total Barbie style dress too. I'm not sure wrap dresses suit me best but I love the glitz, the colour and again it's a dress that's got sleeves so it's good for winter. Some more glitter, another one with sleeves but this time the Glitter Lace Dress is a bit more of a skater style. I like the see through sleeves and neckline and the sparkle all over is giving me Frozen vibes. 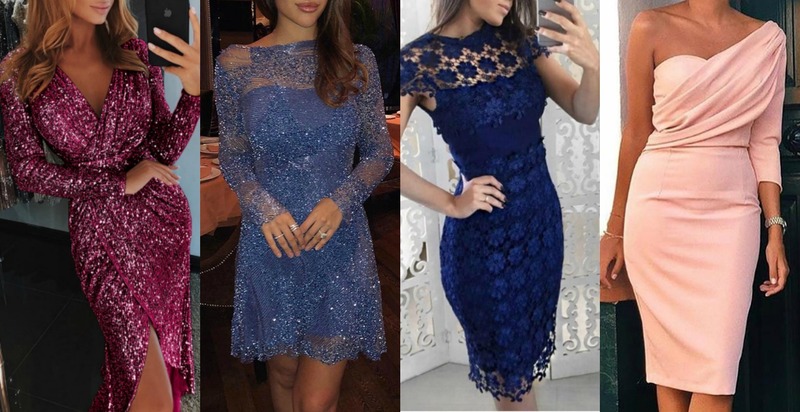 The Crochet Bodycon Dress is another sophisticated option and the navy colour is one of my favourites this year. I like that the crochet lace is all over the dress and the midi length again keeps it a little more elegant. Last up is the One Shoulder Ruched Dress. There's no glitter or lace in sight but it's still got the one sleeve that I'm loving and classic Jenna, it's pink! This might be a nice one to wear to a wedding and not just reserved for Christmas events.